If you’ve longed to bring out the best in your music, but balked at the astronomical cost of high-res music players, then take a serious look at the Activo CT10. At $299, this budget-priced player is anything but entry-level. 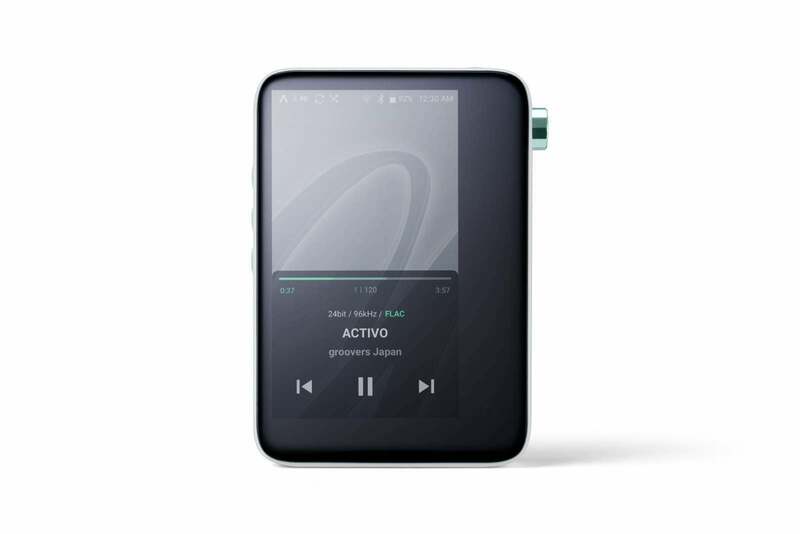 The Activo CT10 is a high-resolution digital audio player from Groovers Japan, a high-res download and streaming music provider based in Japan. The CT10 was developed in collaboration with Astell&Kern and iRiver (Astell&Kern’s parent company). Astell&Kern makes some of our most favorably-reviewed high-res digital audio players, though they can cost up to several thousand dollars. Can the Activo give you a taste of that high-end sound at a fraction of the price? Absolutely. The Activo CT10 features Astell&Kern’s Teraton TM200, a circuit board that combines a Cirrus Logic CS4398 digital-to-analog converter (DAC), an analog amplifier, an independent power unit, and a jitter-preventing clock. These features ensure your digital files will be reproduced with the utmost fidelity and accuracy. Listening to well-recorded music on high-quality headphones, you’ll notice serious sonic refinement compared to your smartphone. The CT10 checks off all the boxes you’d want in a high-res digital audio player. 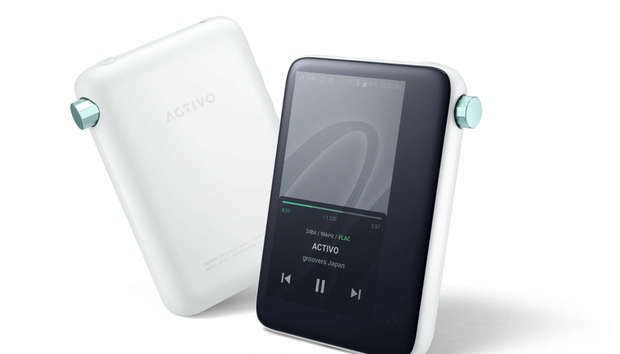 Promising “better than CD-quality” sound, the Activo will play every major lossy and high-res file format, including FLAC, ALAC, DSD, and WAV up to 24-bit/192kHz. There’s even a menu option called “Hi-Res,” so you can browse only the high-res music files on the player. 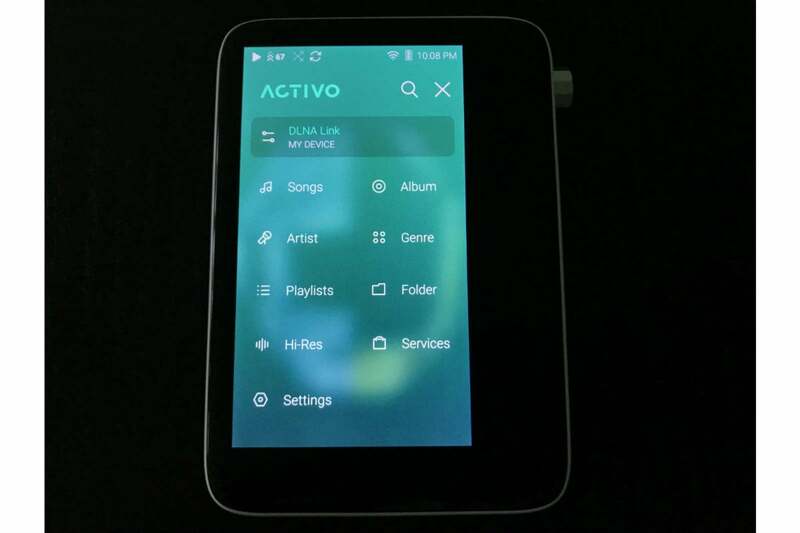 The Activo will also play lossy formats, such as MP3, AAC, and WMA. Lossy file formats discard some data to make smaller files, but you’ll never get that data back. Most people can easily hear the difference between lossy and lossless encording of the same music. It’s easy to browse the onboard storage as well as the contents of a mounted microSD card slot. High-resolution lossless files can take up a lot of storage space, and the CT10 comes with a modest 16GB of onboard storage. If you’re thinking that’s too little storage for lots of high-res files, you’re be right. Thankfully, the CT10 comes with a microSD slot capable of supporting up to 400GB microSD cards, giving this player maximum storage capacity of 416GB. That’s not too shabby, although the prices for a 400GB microSD cards start at about $160 on Amazon. Things get even better with the Activo’s strong network support, which I’ll talk about more below. Upping the high-res ante, the CT10 is among the few budget players to support aptX HD and MQA. AptX HD allows playback of LPCM data with up to 24-bit resolution and sampling rates as high as 48kHz over Bluetooth, provided you pair it with wireless headphones that also support aptX HD. That’s a fancy way of saying it’s capable of streaming high-res music wirelessly. The aptX HD codec is backward compatible with headphones supporting the regular aptX codec, which delivers near-CD-quality audio. MQA, short for Master Quality Authenticated, is an audio codec that applies a digital fingerprint to a file to guarantee it was sourced from the original master recording. Tidal is now serving up high-res MQA streams, typically at 24-bit/96kHz. You’ll need a Tidal HiFi membership, $19.99 per month, to access the thousands of MQA-encoded albums available with that service. There are lots and lots of hidden features up the CT10’s sleeve, making it an outstanding value proposition. I’ll need to gloss over some of those features in the name of brevity. 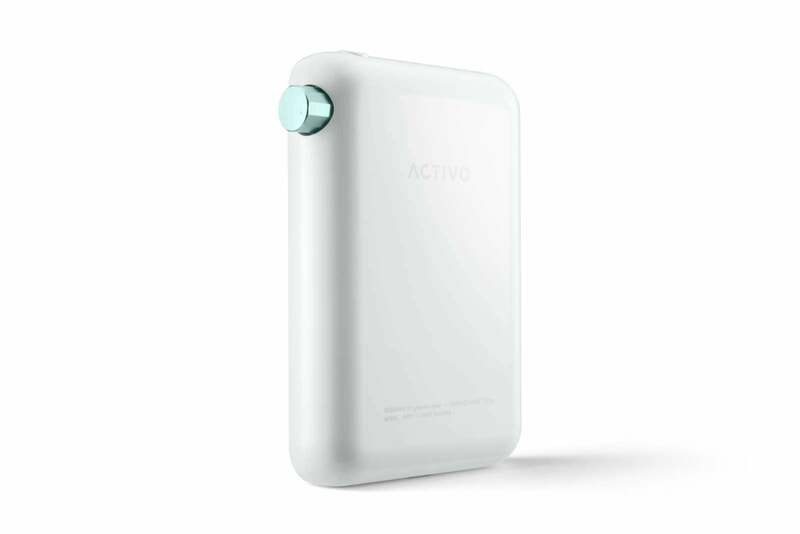 Let’s start with the Micro-USB port on the Activo’s bottom, which serves three purposes: First, it allows you to charge the internal battery, which is rated to deliver about 10 hours of playing time. Second, you can mount the CT10 like a thumb drive and copy music files to the player. 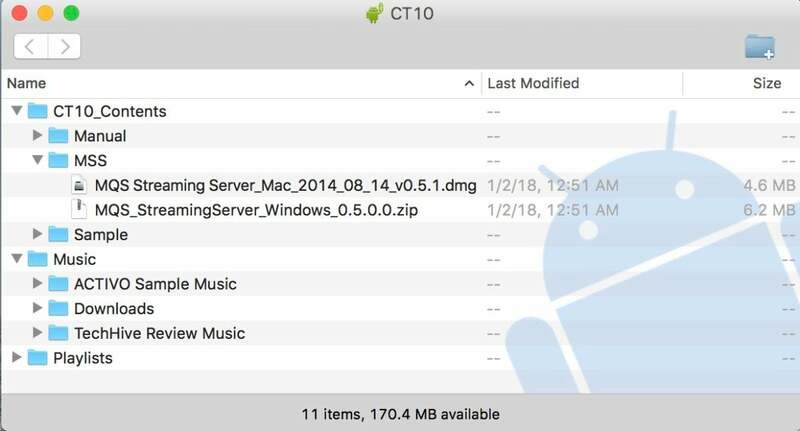 If you’re a Mac user, like me, you’ll need to install the free Andriod File Transfer Utility to copy music files onto the player. Third, you can switch the Activo into DAC mode and use the player’s superior internal audio circuitry to play music stored on your computer. That’s another way you can go beyond the player’s internal storage limitations. But there’s another feature, too. In DAC mode, you can use the Activo’s superior audio circuitry and DAC to play audio stored on your computer. 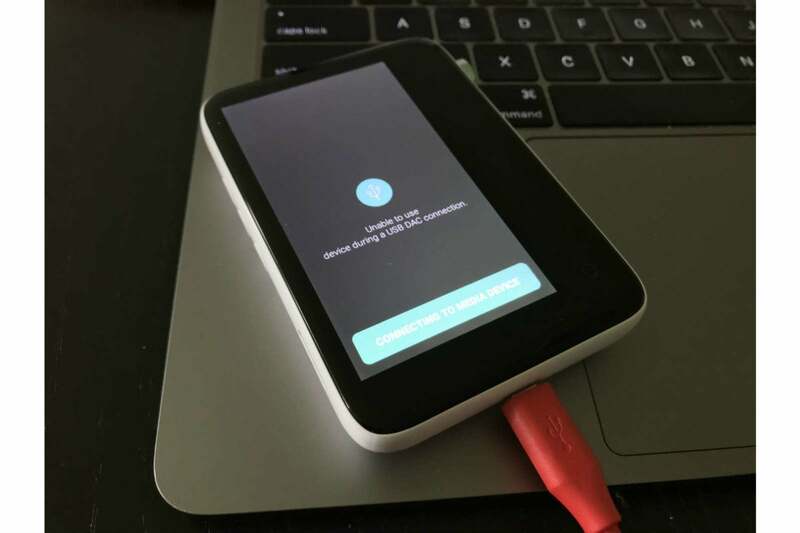 Onboard Wi-Fi isn’t just for connecting to Tidal and Groovers, or for downloading firmware updates, it opens a whole world of network music connectivity. 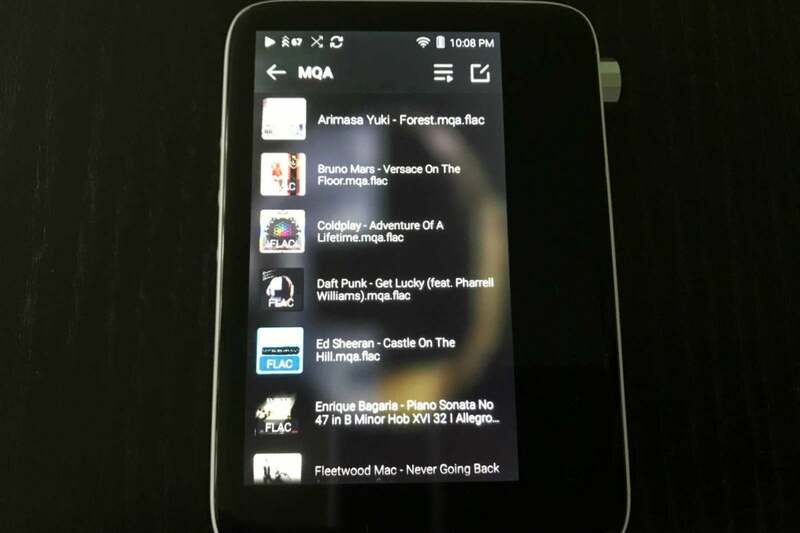 The Activo can play music from any DLNA server on your network. Have a computer but not a DLNA server? No problem, the CT10’s internal disk comes with an installer for Astell&Kern’s free MQS streaming server software, for Mac and Windows PCs. Just mount the player like a USB thumb drive to access the installer. It’s easy to use, too: Install the software, follow the prompts, and forget about it. Once I’d done that with the CT10, I had wireless access to more than 21,000 music tracks on my computer. The Activo CT10 comes with a free, easy-to-use DLNA-compliant streaming server for Mac and Windows computers. The Activo does omit some features found on higher-end players. There’s no 2.5mm balanced output, for example, nor is there a S/PDIF digital or line-level analog output. Then again, these are features the average consumer will never miss. Whether you’re a novice or a pro, you’ll find the Activo to be a joy to use. It adopts the outstanding user interface found in Astell&Kern’s expensive high-res digital audio players, with some nuanced, graphical refinements. Swiping from the left side of the screen brings out the Activo’s main menu. Swiping down from the top provides quick access to oft-used system-specific settings, such as wireless, brightness, and USB settings. Swiping from the right is contextual. It will bring you back to the currently playing song if you are browsing or, when a song is playing, show the other tracks on the album. Swiping up from the bottom shows a song’s details. Swiping from the left side of the screen brings out the Activo’s main menu. The CT10’s interface was always smooth and responsive, thanks to its quad-core processor, which handles the heavy lifting. The Activo’s snappy response was in sharp contrast to the now discontinued AK Jr. I never noticed any lag or music drops during my time with the CT10. The Activo CT10 is also downright cute. It would be the high-res player of choice for EVE, from the Disney film WALL-E. The CT10’s sleek, shiny, white, polycarbonate case envelops the rounded glass edges of the all-black, touch-screen display. During my use, the front glass seemed to be more oleophobic than than the white polycarbonate case, which was easily prone to fingerprint marks. I can’t comment how scratch-prone the case might be over time. Matching white buttons for power, play/pause, and fast-forward/rewind slightly protrude from the case’s horizon, while slightly curving to match the CT10’s body. The most notable physical feature is the shiny, dodecagonal volume knob on the player’s right-hand side. The metal knob is mint green, resembling the one on Astell&Kern’s AK70 high-res digital audio player. The player has a white polycarbonate back and mint-green colored volume dial. The Activo sat naturally in the palm of my hand; the player was perfectly suited to ambidextrous use. While holding it in my right hand, my thumb fell naturally on the volume dial, with my index finger on the control buttons. When I shifted it to my left hand, my index finger took over volume control duties while my thumb had instant access to the controls. After using the Activo in different contexts, I wish that the dial had a knurled texture. If my right thumb was slightly sweaty, I didn’t have the same friction to move the dial easily. The same wasn’t the case when moving the dial with my left index finger. The Activo’s active screen doesn’t fill the player’s entire face, leaving a black space down the right-hand side. My biggest complaint about the Activo CT10 is its tiny 3.4-inch color screen. Only the left 4/5 of the glass area lights up, leaving an odd black space down the right-hand side. This industrial design decision is a bit of a head-scratcher. The screen primarily became a nuisance when I wanted to use the keyboard for searching or entering credentials. The keyboard is far too small for average-sized fingers. I had to retype my Tidal password more than a few times because my fingers would hit the wrong key. Should you have difficulty with small font sizes, you might have some trouble with the CT10’s small type. 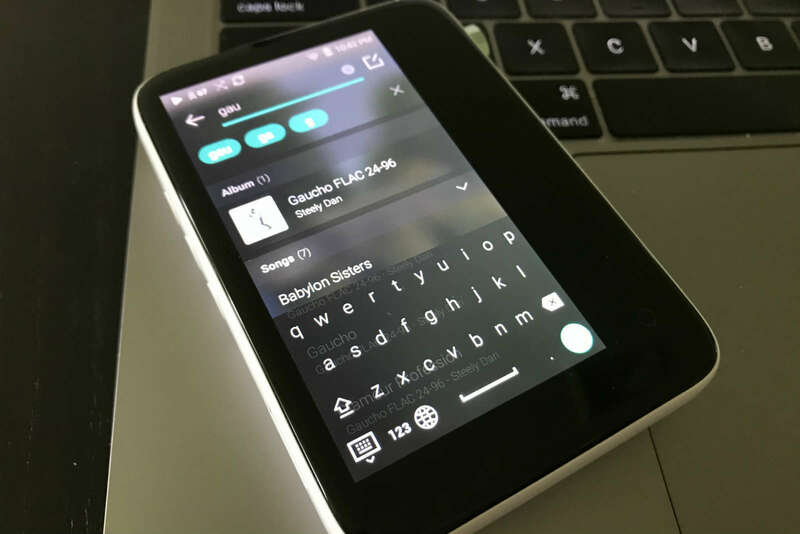 The Activo CT10’s on-screen keyboard is extremely small. I tested the Activo with a pair of Astell&Kern Billie Jean in-ear monitors (in for a forthcoming review), as well as a pair of Focal’s Clear over-the-ear headphones. I used high-res music files from my collection and streamed music via Tidal. Needless to say, my praise of this player’s design extends to its refined sound. The Activo CT10’s sleek design, compact size, superb interface, snappy response, rich feature set, and $299 price tag render this high-res digital audio player a veritable steal. It’s an outstanding performer, musically speaking. Be sure to pair the CT10 with a refined pair of headphones; and please don’t dampen its performance with MP3 files. If you don’t need the hardware features found on more expensive players, or you’re just looking to get the most out of well-recorded music, I can’t think of a better buy.